As scheduling for both cameras and microphones is pretty much identical it's covered here in it's own section. iSpy includes a scheduler which allows you to configure recording, detecting, alerting and timelapse settings changes throughout the week. Adding a Schedule: To add a new schedule, select a start time and a stop time and check the days you want to apply this schedule on. You then check the options to the right to enable or disable features for this schedule entry. Finally check the Active checkbox and click "Add". The schedule entry will be added to the listbox at the top of the tab. You can click on this entry to edit it or delete it. 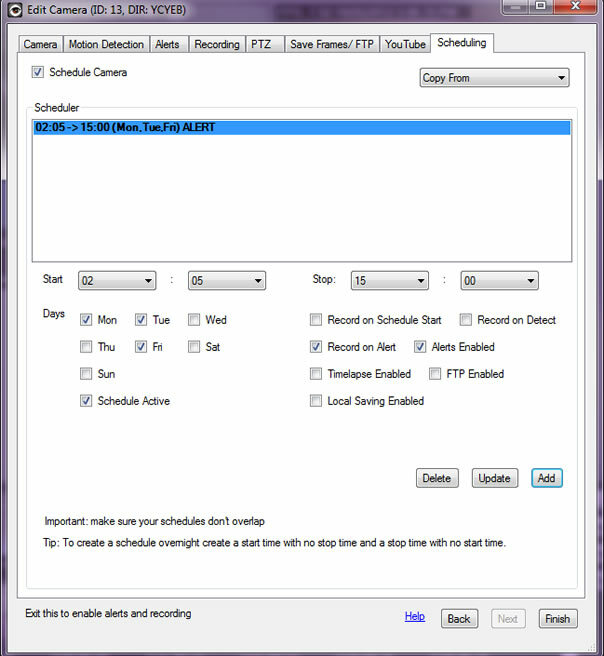 You can view your schedule plan in iSpyConnect by clicking the spanner icon below the camera or microphone thumbnail.